1. Linea Koro Parrot Print Cushion £20.00 [x] : It will always surprise me how many cushions I fall in love with (it's honestly a problem) and this Linea parrot cushion has definitely stolen my heart! 2. Linea Parrot Ornament £30.00 [x] : If you love parrots but can't exactly have the real thing, then get one of these adorable parrot ornaments. LOVE. 3. Tiger Pencil Pot £14.95 [x] : Desk organisation definitely doesn't need to be, nor should it be boring so if you want to spruce up your desk space, grab one of these tiger pencil pots. 4. When In Rome Soap £4.50 [x] : Looking for something quirky and unique to give a friend? Then get them a bar of this fun When In Rome soap! 5. 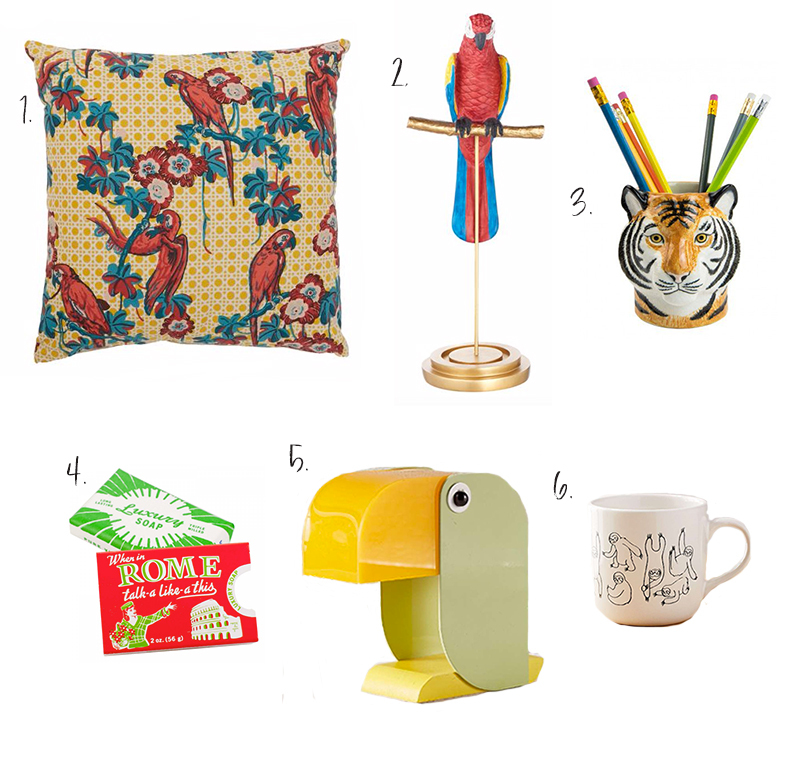 Toucan Desk Lamp £75.00 [x] : Dare I say it this may be one of my favourite homeware pieces I've seen all year. I just love the nod to retro design and of course the fact it's a toucan. 6. Sloth Print 15oz. Graphic Mug £9.00 [x] : Let's face it who wouldn't love a sloth print mug? So cute, I need! That sloth mug is so adorable! Ugh I love everything.